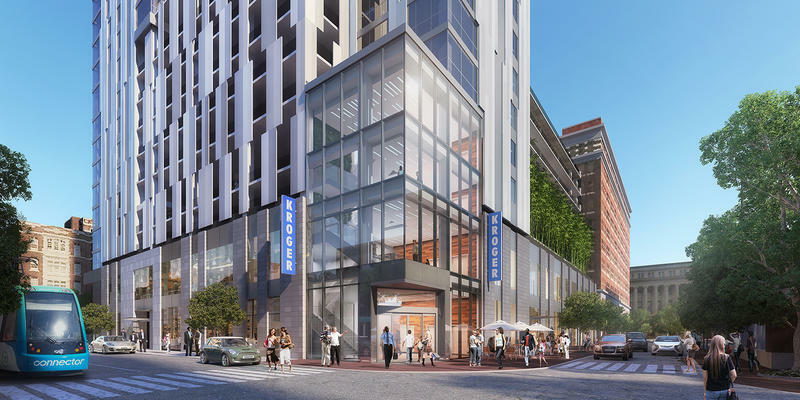 The 45,000 square foot Kroger store will be part of an 18-story mixed use development at the corner of Walnut and Court streets. The new building will include a 555 space parking garage and 139 market rate apartments. The project is expected to cost $90.6 million. The city is providing $8.5 million for the project, with $2 million going to help developers with the residential portion of the plan, and the rest to assist with garage construction. The city is also providing two 15-year tax exemptions. The city will own the parking garage but it will be operated by 3CDC. North American Properties, NorthPointe Group, and Rookwood Properties will develop, own, and manage the apartments. At least two council members are concerned about voluntary payments to help pay for streetcar operations that are not included for part of the project. Developers for Downtown and Over-the-Rhine projects are being asked to provide a percentage of their tax abatements to help fund the streetcar. For the Kroger development, the developers on the residential part of the project will voluntarily pay $75,000 to $100,000 to the streetcar operating fund. But the $65,000 voluntary payment from Kroger will be used to help pay the debt service on the parking garage instead of the streetcar. It's the first time since the VTICA (voluntary tax incentive contribution agreement) was started that there has been an exemption. Community and Economic Development Director Oscar Bedolla said the city believes the project will generate revenue for the streetcar in other ways. "We believe this is an amenity to the city, and as well, as we looked at it to the streetcar itself," Bedolla said. "We think it will increase ridership and we'll see economic value in that direction." Council Member Chris Seelbach doesn't like that portion of the plan. "I think it's a slippery slope giving exemptions to this," Seelbach said. "This project is absolutely going to benefit from the streetcar line. I don't think we're going to make up the VTICA revenue that would be generated for the streetcar operating budget by people buying sandwiches." Meanwhile, the Budget and Finance committee also approved an ordinance that brings the city budget approved last week back into structural balance. City Council had approved an ordinance that would ban city officials from implementing a "booting" program for vehicles with three or more unpaid parking tickets. The city manager had proposed the idea and it was estimated to generate $600,000 in revenue. Council covered that revenue shortfall in the budget, but with a one-time revenue source against continuing expenses. That isn't structurally balanced. The proposal approved Monday takes $600,000 for low income housing assistance and funding the Hamilton County Heroin Coalition and makes both one-time grants. That makes them non-recurring expenses. Seelbach said he still doesn't think the budget is structurally balanced. "We're now taking two programs to help low-income people and to help our heroin epidemic and saying it's only going to do it for a year," Seelbach said. "And these problems are not going to be solved in a year." But Council Member Kevin Flynn pointed out that many spending items in the budget are covered with one-time sources and are not recurring expenses. "We're not talking about never doing these programs again," Flynn said. "In fact, I think the expectation is that we will continue those programs but we don't have those ongoing resources right now." The bond rating agencies typically look at whether the city's operating is budget is structurally balanced when determining the city's ratings. In the past, the city was using one-time sources to pay for continuing expenses, and that, in part, resulted in lower bond ratings and higher borrowing costs. Cincinnati Mayor John Cranley has used his veto power to fix what a council ordinance he believes would have resulted in a structurally unbalanced city budget. On Wednesday, council voted 5-4 to reject a plan from City Manager Harry Black to boot cars with three or more unpaid parking tickets, a move that would have generated $600,000 for the city. In Black's proposal, that money would be replaced with a $600,000 withdrawal from the urban development fund.